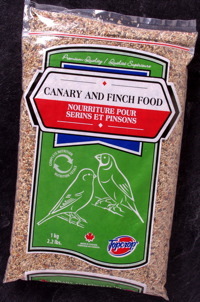 Topcrop Canary and Finch Food has been formulated as a 100% complete and balanced diet for domestic canaries and finches. Since your pet is a creature of habit, it is important to establish a constant location for its food. Only provide what will be consumed within a 24-hour period. Unlike many other pets, birds have virtually no body fat reserves, and will perish quickly if they go without food even for a single day. Make sure you clean its food dish every day. Ensure that a fresh supply of water is constantly accessible. Should your pets food become contaminated with urine, droppings or water, discard the soiled food, wash out and dry the dish and replace with a fresh supply of food. This product has been specifically formulated for canaries and finches. It is not meant to feed any other animals, nor is it appropriate for human consumption. Although Topcrop Canary and Finch Food is a complete nutriment, you may want to occasionally give your bird a seed stick or one of the many other prepared treats available on the market. Canaries and finches have very specific dietary requirements and should only be fed food that has been specifically formulated for them. Feeding them food intended for other animals may result in severe health consequences. When taking your animal out of its habitat for any reason, never leave it unattended, as loose pets can sustain serious injuries. Canary grass seeds, canola seed, red prosso millet, golden finch millet, nyjer seeds, flax seeds, mineral oil.